The Women’s Chamber Choir of Hope College will perform its spring concert, with Luminescence and 12th Street Harmony, on Monday, April 16, at 7:30 p.m. at St. Francis de Sales Catholic Church. The choir will be joined by Hope’s close-harmony groups, Luminescence (women) and 12th Street Harmony (men), as well as by pianist Lannette Zylman-TenHave, violinist Erin Gilbert and cellist Laura Vanderveld. 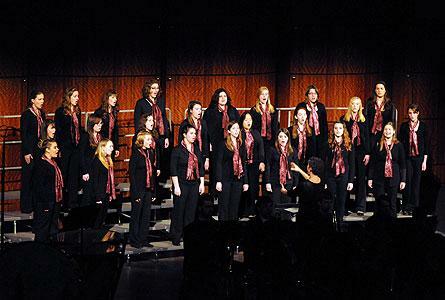 The Women’s Chamber Choir, established in 2001, is an auditioned group of 20-25 Hope students. The group is directed by Jennifer Wolfe, adjunct assistant professor of music.